The productivity puzzle -or the productivity slowdown- is one of the current debates among economists. The sluggish evolution of productivity after the financial and economic crisis in the developed economies has raised many different hypotheses that seek to understand the underpinnings of this phenomenon. Among these hypotheses outstand the lack of aggregated demand due to an excess of saving, insufficient investment opportunities, the lack of groundbreaking ideas or innovations, the misallocation of resources, or the mismeasurement of productivity due to the emergence of new type of products and production factors that are not included in the official statistics or which prices are not correctly measured. 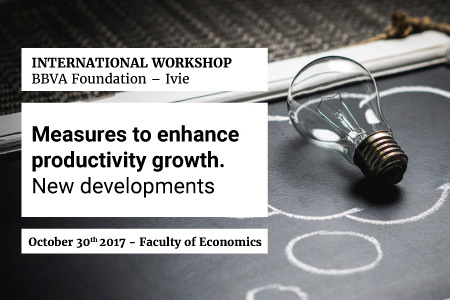 This Workshop addresses several of these issues, trying to shed some light on the factors that determine the productivity slowdown, and which elements or variables could help to boost it. The contributions will be organized around the following topics. First, since the mid 2000’s a strand of the literature stressed the growing importance of intangible assets as drivers of productivity. In parallel, human capital has been always a hot topic, and new approaches for measuring human capital are focusing currently on skills instead of on the formal level of education. Evidence of the role of both intangibles and the new human capital metrics for growth analysis will be discussed. In addition, the relevance of the allocation of resources across firms and industries for productivity growth, and the implication of the cross-border fragmentation of the production process –the so-called global value chains– will also be issues of attention. The Workshop will also address the measurement challenges economists are facing in the context of the new economy. The emergence of new tools such as big data and types of assets is changing the way to measure the economy. The Workshop will allow discussing how to measure two aspects: modern economies’ digital transformation and the use of big data, and the measurement of a concrete intangible such as brands. The Workshop will deal with all these topics bringing together leading experts from the academia (King’s College London, University of Groningen, LUISS University in Rome, ISTAT and the University of Valencia) and from international organizations such as the OECD or the European Commission. The Workshop will be an excellent opportunity to discuss and to exchange ideas on the productivity challenges of developed economies.